Should i be subscribed to bbmax first before calling globe to refresh my service books or the other way around? Yes. You need to register BBMax first. Hi! is it working with BB SOCIAL? hi. would you know if there is also true for smart? can i subscribe to smart’s bbmax and use my 9320 as hotspot? I don’t know if Smart have the same workaround in Globe. I am using a 9320 and I’ve already received a message from globe saying that “Globe Advisory: We have activated your blackberry service as requested. Thank you.” I’ve also done a hard reset but the hotspot feature still won’t work. Any ideas Ian? Try to perform hard reset again (battery pull). Why it’s not working on bbmax599? I’ve asked them to refresh my service books three times ,STILL I CAN’T ACTIVATE MY MOBILE HOTSPOT…. does this workS only for bbmax 50? how do I fixed this sir? To test whether this MH working.. If you want.. Hey!!! It really works! I just tried it! Thanks for the information! Nice! 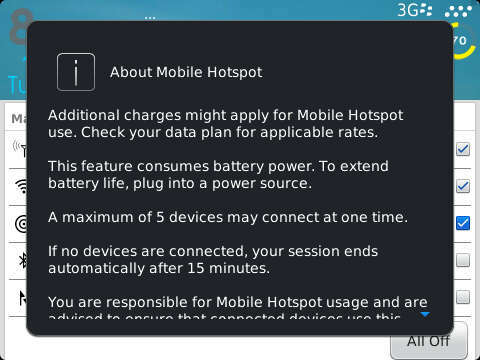 Enjoy your mobile hotspot feature!